Lemon Tart Recipe - a low calorie, low glycemic lemon tart to die for! This lemon tart recipe will not send your blood sugar skyrocketing yet it tastes exactly like the luscious, citrus tart you know and love! What makes this recipe so different is one ingredient. Because of this ingredient it is NOT going to be a high caloric dessert. You will surprise your guests or family with this tart recipe because with it's golden color it almost looks like a pumpkin pie. But one bite sends your taste buds off in an entirely different and amazing direction because it will melt like liquid gold and be irrisistibly lemony sweet...a perfect mix of flavors of bright citrus that melt in your mouth. Roll out your chilled dough on a floured cutting board. You want to press it into your tart or pie pan as far as possible so you do not over handle the dough which tends to get more tough and less flaky. To make the filling, chop the walnuts fine or process in a food processor. You want them to be as fine a powder as possible. Beat the eggs and add to a large mixing bowl with the walnuts. Add the rest of the ingredients and blend well. Pour into tart or pie shell and bake at 350 degrees for 35 minutes. The custard will set up well and it will have a coarse texture that is a golden light brown color. 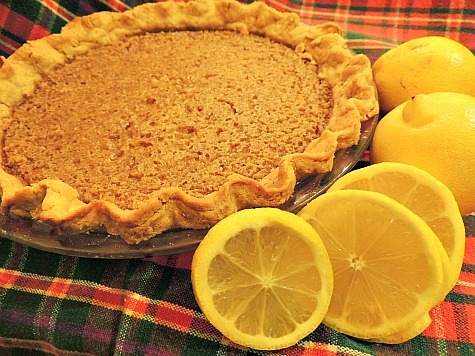 Serve with sliced lemons or your eaters will think they are getting a pumpkin pie! Have all the ingredients out measured and ready to use. Place the flour, salt, and diced butter (at least 16 pieces) in a food processor and pulse 5 or 6 times to break up the butter. Add the egg yolk and ice water water and pulse 2 or 3 more times. The mixture should look like a bunch of small lumps that will hold together in a mass when you press it together. You may need to add a little more water. If you don't have a food processor then just mix the whole thing by hand, using your fingers to break up the butter if necessary. Turn the dough out onto wax paper and form into a large ball that you will chill for 2 hours. This allows the four particles to absorb the liquid as well as firm the butter and relax the gluten. You want to work the dough as little as possible. Roll the dough out quickly and press into your tart or pie pan. A tart pan will give you a free standing crust that you can form with a decorative edging just using the dull side of a knife to make a diagonal indentation. The pie pan will take a fluted edge using your thumbs and index fingers to make the "flute." Be sure to prick the bottom and sides of the shell with the tines of a fork. The one ingredient that makes this lemon tart recipe special, the one that makes it have a low glycemic index, the one that adds to it's flavor, also gives it the golden brown color and texture. And that is the coconut palm sugar. It is made from the crystallized nectar that flows from the coconut palm tree. It looks like brown sugar and has a moist and granular texture. The palm sugar has a more natural earthy flavor but it's nutty and sweet and has vitamins, minerals and other nutrients left in. This will not look like any lemon pie or tart you've made or eaten before but the taste is as sublime and in fact better than an ordinary lemon tart. There is lots of protein in this lemon tart recipe which also helps to mitigate the glycemic index. The protein is in the walnuts (plus good fats) and eggs which add considerably to the nutritional content. Not only that but lemons provide vitamin C and so many phytonutrients especially in the lemon rinds. So here's the amazing thing. A lemon tart that is an honest to goodness low calorie, low glycemic lemon tart with the same great flavor! * The Doctor's Book of Home Remedies by Selene Yeager and the Editors of Prevention, page 357. Return from Lemon Tart Recipe to Low Glycemic Recipes. Return from Lemon Tart Recipe to Lifetime Fat Loss home page.